Tips on Cleaning Printer Cartridges | TonerGreen - Eco-Friendly Toners from the U.S. Cleaning your printer cartridges may be easier than you think. It’s not like you having to mop something or you need to scrub parts of your printer; nothing like that at all. Here are those simple ways that you can manage to clean your printer cartridges. Your printer will usually have that cleaning command to help you maintain the performance of your printer cartridge. You can check this option by going to the Properties menu of your printer’s settings then click on the “Clean” part. It will always be helpful to run a test page from your printer to see if it is clogged or not. 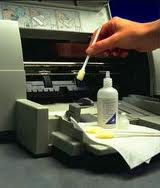 When there are some blurry parts or streaks on the printout, it would be best to do the Cleaning Command then print a new test page again. If you are really afraid of touching your own printer, you can ask help from professional technicians or someone knowledgeable with printers to clean the cartridges for you. When you think that the problem is with the hole on your printer cartridge, take it off then add a few drops of alcohol on the hole part. Keep it there for 20-30 minutes then wipe it with a clean cloth. When the cloth acquires ink stains, this is a sign that your printer cartridge is ready to use. You don’t have to fret when something seems wrong with your printer. Just make sure to do proper maintenance and cleaning with it and its parts to keep your relationship harmonious just for your printing needs.